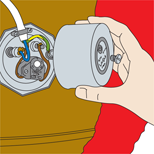 Summary: How to change a water heater element, remove old water heater element and fit a new water heater element. When purchasing a new element, you need to know what type you require. The two main options are top or side entry elements. Start by switching off the boiler and the electricity supply to it at the consumer unit. Then switch off the water supply to the cylinder and drain the water from it. You can can turn off the water from the isolating valve on the supply pipe. If you do not have an isolation valve on the supply pipe then you will need to drain the cistern. To drain the water, you need to cut off the supply to the cistern. Do this either by turning the stop-tap to ‘off’, or alternatively, tying the ball valve to a length of wood resting on the top of the cistern. This will raise the ball valve and hold it there, preventing more water from entering the cistern. Then turn on the bathroom tap to drain the supply pipes. Attach a hose pipe to the drain valve on the cylinder and drain the water by opening the valve, into a bath tub or other suitable place. A top entry immersion heater will only require 4.5 litres of water to be drained from it, whereas a low-side entry element will need to be fully drained. Close the drain valve once the cylinder is completely drained. Now you need to remove the immersion heater so it can be replaced. Do this by unscrewing the immersion heater cover and making a note of which cores connect to which terminals. This will enable you to replace everything correctly. Now you can disconnect them. 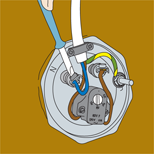 To unscrew the immersion heater you will require an immersion heater spanner or a ring spanner. Or for lagged cylinders, you may require a box-type immersion heater spanner. This type of spanner is turned using a tommy bar. Now you can remove the immersion heater element. You will need to check that there is a fibre sealing washer on the thread of the tail of the new immersion heater element. In the absence of one, use PTFE tape instead and wrap it around the thread. Insert new heater and screw in position tightly. You need to check for leaks before you are finished, so turn the water supply back on. If there is a leak, tighten the heater until it stops. Reconnect the cores to the correct terminals in the new immersion heater and set the thermostat. Then replace the cover and restore the electricity supply. Remove the immersion heater cover. Remember which cores are connect to which terminals before disconnecting them.